Do you send out Christmas cards? I do and I love to get started early in the season. I'm always so excited when I get cards in the mail and love catching up with family this way (even if we're pretty up-to-date because of the Facebook these days...). 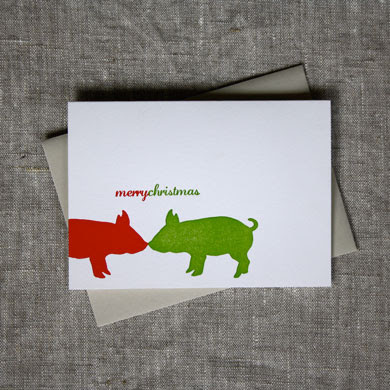 1) Christmas Piggies - I've mentioned my love for Linda & Harriet (I have both the perpetual calendar and the 2011 calendar, as well as a bunch of notecards) and I think this is the cutest Christmas card out there. Plus, at $10 for 10 letterpress cards, they're a total steal. 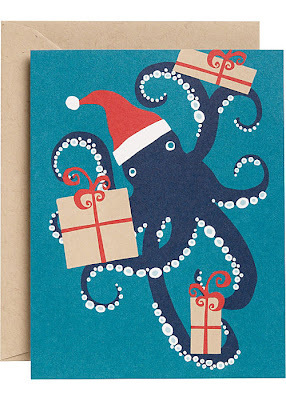 2) Holiday Octopus - How cute is this octopus? I love that the main colors are teal and navy, not traditional Christmas colors, but that this is so festive and cheery. 3) Polar Bear Cards - Anybody notice an animal theme going on here? These are blank on the inside which leaves you lots of space for a long note to share all of your holiday cheer! 4) Honk if you love Christmas - This is sort of cheating, since I was sent this exact card by our pals Tom & Jess last year. I loved it so much that it stayed on our fridge until June. Puns and Christmas... does it get any better? 5) Christmas Penguin - Though the card below is available from Kate's online, it's made by my old neighbors in Brooklyn, Fusion Designs. I've sent out their cards for the last few years and they're always funky and colorful. Their shop, if you're wondering, is at 140 Atlantic Avenue in Brooklyn. So there are a few ideas...what will you do for Christmas cards this year? While you're at it, don't forget to get your holiday stamps! 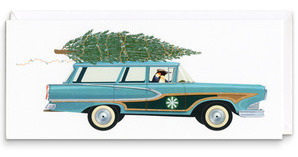 Tis the season... stay homey!